Every day your skin is exposed to a whole range of environmental and chemical threats, which means giving your skin a nourishing regime of TLC between your treatment visits to the salon is essential if you want the time and money you invest in salon treatments to pay real dividends. This is why our ethos of creating bespoke solutions for your skins problems doesn’t end in the treatment room. We can do this because we have exclusive access to unique 'Dermaviduals' skincare ingredients which we can blend into exactly the right products for your own unique skin needs. The formulation of Dermaviduals ingredients and products are unlike any others you've used before because their focus isn't on surface cosmetic results, pretty packaging or smelling divine ... instead they simply use pure 'skin identical' ingredients that combine in a synergistic way to maintain the integrity of your skin's natural barrier and prevent premature ageing. Dermaviduals products are free from emulsifiers, fragrance, parabens preservatives, mineral oils, silicone's and artifical colours. There are 29 liposome actives in the range that can be blended into moisturisers or serums and made up for you to take home to enhance your skin care results. They also have a unique delivery system that enables active ingredients to permeate through the skin barrier safely in their most pure form. Put simply ... Here at the Skin Health Clinic we lovingly blend skin products for you to use at home that match the exact needs of your skin and the long term results of this unique approach are ... AMAZING! Many people don’t realise that when it comes to healthy skin, what you take internally is as important as what you apply topically. Skin conditions such as acne, eczema and premature skin aging are commonly linked to vitamin deficiencies in the skin cells. 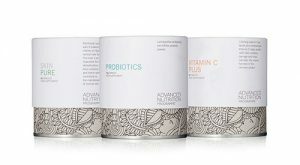 These premium supplements are unique because they provide the optimum daily amounts of vitamins, minerals specific to your skins needs. Advanced Nutrition is designed to enhance the benefits of your skincare regime and help to target specific skin concerns.